Governor Carcieri, RIEDC Director Keith Stokes, the Quonset Development Corporation and hotel developers from New Boston Fund, Waterford Development and ProCon broke ground last Thursday for a new Towne Place Suites by Marriott hotel. The 103-guestroom hotel will sit on 4.6 acres across from The Shops at Quonset Point, and is designed for the extended-stay traveler looking for moderately priced accommodations. “The pace of building and job creation at Quonset has been impressive, in spite of the economic downturn,” said Governor Carcieri. The development joins eight other construction projects currently underway or recently completed at the Quonset Business Park, home to 164 companies. Quonset has added 2,700 new jobs since 2005, bringing total employment up to 8,842 jobs. “The fact that the developers were able to finance a hotel in this difficult economy speaks volumes about the depth and breadth of the growth at Quonset – and the potential here,” said QDC Managing Director Steven King. The new hotel at the Gateway is expected to be the first LEED-certified in the state. Sometimes I worry that developing Quonset will just give us an excuse to create yet another McMansion housing boom in South County. that is easily the ugliest LEED certified building ever. I know that it is Quonset and all, but honestly, they couldn’t come up with something that look less like something you’d find in Centre of New Englande? It also needs some bigger trees. I really hate that the accepted norm is the lowest, cheapest, most unattractive option. It’s the norm in large part because zoning makes traditional urban development impossible without a slew of variances. On the one hand, I like that there is development and jobs at Quonset, but there is no reason it can’t be well developed. There’s no reason that the people who work at Quonset shouldn’t have an attractive, walkable village at the Gateway. And there’s no reason the state and QDC shouldn’t be seeking the best design standards possible (remembering this is LEED, but it is so ugly (and I don’t think parking between the building and the street should allow one to attain LEED (but that is another topic))). There is some hope. North Kingstown has been doing planning work to make the Post Road corridor more dense and walkable. Although that makes the fact that the development in the Quonset Gateway (at the center of the North Kingstown plan) being so suburban all the more annoying. Yeah, i don’t know how anything can be LEED certified if the only way there is to drive. We needn’t always settle for the worst, when we know things can be better for the same money. Agreed with both comments. However, companies have no incentive to provide the type of walkable village type development because they would have to spend more time and money arguing for a variance in front of zoning boards and commissions because they did not meet the minimum parking requirements and the setback is too small. Either munipalities have to embrace changes to make these walkable developments easier to build (plus, we as residents that support this development need to be the agents of this change), or greater efforts need to be made to find developers with the expertise in traditional urban development and with resources needs navigate the zoning variance process. This hotel type is usually based on a prototype. The total number of keys (or rooms) is usually determine by operational and market demands, such as a specific number of key per floor to accommodate housekeeping requirements for room turnover or limiting the maximum number of elevators to reduce construction costs or occupancy assumptions. The size and placement of windows occur at repetitive intervals due to room dimensions and the number of keys per floor. For many hotel brands there’s usually a suburban and urban prototype developed. The Quonset hotel is obviously a suburban model. In most instances there’s little difference between the massing of these hotels between major hotel groups like Marriot, Hyatt, Hilton, Starwood and including individual brands under each group. The only real variations are with the interior finishes and layout, and building facades. One of the standard complaints about this kind of hotel is the horizontality of the massing. I’m not remotely defending their design or am in favor of it, but there was effort made to break down the horizontality with a series setback and pushed-out faÃƒÂ§ade sections. The materials brick and clapboard, whether authentic or faux, are recalling a New England or northeastern vocabulary. However, the execution is mediocre. It is absolutely possible to design a LEED building that can only be reached by car. LEED is a rating system that accumulates points for various environmental features of a building that may include energy efficiency, water consumption, local or regional sourcing of materials, recycled materials, construction methods, and transportation. Being adjacent to a bus line, subway, or commuter rail line surprisingly only adds a few points. LEED is more about the building not transportation. As for the parking the irony is that even with suburban hotels parking lots are rarely over two-thirds filled, since especially with business travel two people will arrive at a hotel in the same car but take separate rooms or will arrive in a cab or hotel van from an airport. With North Kingstown’s proposed Post Road zoning regulations maybe some of the parking lot excess could be used as development opportunities in the future. Love the name Towne Place (town with an E)….makes me almost think I am staying at nice little bed and breakfast….not. Ironically…there is no town (E or otherwise) and not much of a sense of place. The entire hotel design is sitting on a hard drive at Marriott HQ waiting to be plopped down on the right size lot where the demographics and financials deteremine it will make money. Its probbably labeled “Towne Place-New England Facade” as opposed to the one one with the Southwest facade they will stick on a lot outside Phoenix. Do you think any provisions have been made to tie it more closely with the shopping center it is being plopped down next to so that one might be able to stroll over to Dave’s for some food or Kohl’s for a new shirt or Supercuts for a trim… It is being touted as an “extended stay” hotel. I have a feeling there will be no easy way to WALK to the shops. In fact, it will probably end up being easier to drive. It just proves that there really is no master plan as to how the Quonset Gateway should function…which is why we have a strip mall and an ugly hotel, albeit with slapped on New England charm. I don’t know if or how far this Hotel would deviate from the original layout, but it shold be an easy walk to the shops. The renderings shown (in the news video clip online) do not give the appearance that the building is right on Gate Road as depicted in the site plan for Quonset Gateway. Of course many a rendering has been drawn to be more pretty than accurate. Does it still have a porte cochere and drop off as seen on the site plan? We could be looking at the back of the hotel but why make that the main rendering in your press release. It takes more than proximity to make it convenient for pedestrians. Are there walkways or are you crossing a parking lot? How easy will it be to cross Gate Rd during the day and at night? The economy may have stalled continued development but the last time I was down there I didn’t see sidewalks and other amenities shown on the site plan. Are these still planned and will these be in place by the time the hotel opens to accommodate guests? Are there guidelines in place to ensure adherance to things specified in the master plan or is what is on the Quonset Gateway web site just a site plan that may or may not have to be followed? The whole site plan just falls so far short. The person who did the site plan really worked that green pencil, but it is not hiding the fact that it is an ocean of parking. Now I know, even with gas flirting at $3/gallon again, there is still a reality in our society, and that reality revolves around the car. But this area is going to have to be retrofitted as we move further away from that reality. If the hotel is indeed be positioned as seen in the site plan it is better than I feared. And Dan, I think the parking is still what sells which explains the rendering turning it’s back on the porte cochere. I see in my minds eye, that if that is even still in the hotel, it could be a fire exit only. Sigh. Back to the site plan, there is a glimmer of a walkable area in the arrangement of the hotel and the proposed restaurant and retail across Gate Road from it, but then you’ve got a massive parking lot before more retail (is that where Dave’s is now? I haven’t been to Quonset in quite sometime as it requires an overnight trip, being Rhode Island and all you know). Then I’m assuming the big box is Kohl’s. Is Gate Road 2 or 4 lanes? (if it is 4, for the love of Maude, WHY?). That whole area really could have been laid out better, with angled street parking for the smaller shops and the lots for Kohl’s and whatnot pushed aside. Then as we move further and further through peak oil it is not so hard to redevelop the lots when they are not the center of the development. Moving east towards the other big box and the Sports Center. Those 2 restaurants have about 200 parking spaces. I know it is not a build plan, just a sketch, but I counted, it is actually 200+ parking spaces, so give or take in the final design. How many tables are these restaurants going to have?? To Aaron’s point, yes, most zoning now is set to build exactly this and the developers would actually have to jump through hoops to build something (that we would think) is better. But isn’t Quonset removed from NK’s planning/zoning structure? The state could zone this however the hell they please can’t they (remembering that the residents of NK could still stomp their feet and make it hard for the state)? This site plan is really everything that is wrong with “lifestyle” centers. Sprinkle a couple buildings near the street, with some grass and shrubs, superfluous benches and bus stops… but really at the end of the day, not actually functionally walkable. At the end of the day, it is big boxes and way more parking than is needed now, let alone as we drive less and less. And I just can’t get over the greenwashing here. The channel 10 and 12 reports were absolutely gushing. I don’t care if they are giving free blowjobs to raccoons, there is nothing possibly green about this much parking. And yes, I do know that LEED buildings can have parking lots; I do know what goes into certifying LEED, but the irony is just too rich, in my opinion. There is no denying that this can be a better building. We have designers and architects here–let’s see a better building! Quonset’s newest building is taking shape on the outside and turning green on the inside. TownePlace Suites by Marriot, part of developer New Boston Fund’s Gateway project, is framed and has risen to its full height. 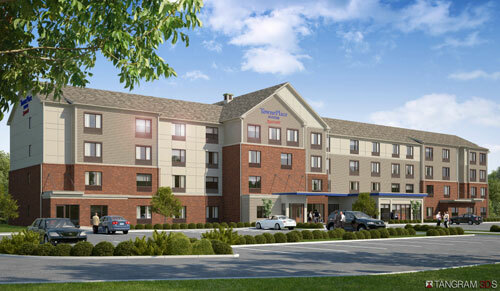 Builder ProCon, Inc. is on track to make the 103-room extended stay hotel one of the first LEED certified in Rhode Island. The hotel has been registered with the US Green Building Council, and many green features have been incorporated since the beginning of the project. Geothermal wells have been drilled, piped and grouted for the building’s geothermal heating system. Recycled materials are incorporated in the building, and unusable materials unearthed during excavation are being crushed for use in other construction projects. The lot is being landscaped for low water needs, with a system for storm water collection. TownePlace Suites by Marriott, which is designed for the extended stay traveler looking for moderately priced accommodations, will offer complimentary continental breakfast and each suite will have separate working, lounging and sleeping areas.